The League of Tana Tea Drinkers -- an organization created to "acknowledge, foster, and support thoughtful, articulate, and creative blogs built on an appreciation of the horror and sci-horror genre," -- has a new Unity Blog posted. The subject this time is a fascinating and timely one: the "allure of evil." As a contributing member, I've got my own thoughts on the subject, which you'll find in the group post here. Specifically, I've written about how the allure of evil is connected with the promise of redemption. I use as my example the character of Riddick (from Pitch Black). Why are modern audiences, and more specifically, genre aficionados, fascinated with Evil? There are likely as many reasons for this ongoing viewer attraction with “The Dark Side” as there are prominent examples of Alluring Evil populating our movie and TV screens. Gazing at popular genre films and television, we might pinpoint one answer to this dilemma, or at least one clue. Perhaps the allure of evil resides entirely in the possibility of redemption. After all, redemption is a ubiquitous notion. 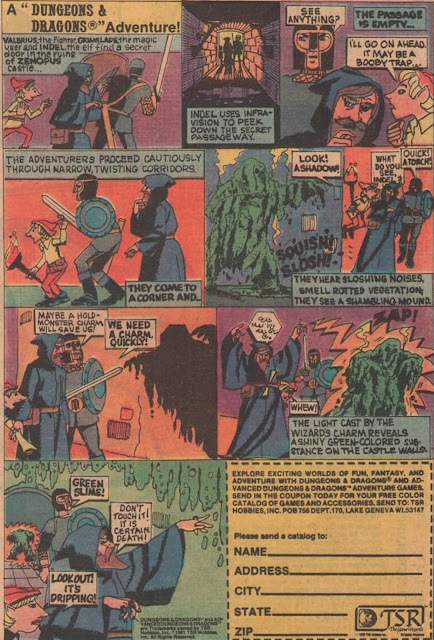 From Darth Vader in Star Wars (1977) to TV vampire icons like Barnabas Collins, Angel and Nick Knight, attentive viewers have watched with obsessed fascination as Evil with a capital “E” has been transformed into Good, usually by the pure of heart. Whether it is the love of a son that transforms Evil (as in Vader’s case), the love of a Chosen One (in Angel’s situation), or even a serial killer’s love of justice (suggested in Showtime’s Dexter), the tale of redemption (and sometimes simply the quest for redemption) is one that doesn’t appear to grow tiresome. On the contrary, this is a genre convention we enjoy seeing repeated. The Cenobite leader Pinhead, for example, faced with a “greater” evil in the person of Dr. Channard, intervenes to help final girl Kristy, and sees his humanity restored (albeit very briefly…) in Hellbound: Hellraiser 2 (1988). Mafioso Michael Corleone searches desperately for a way out of his life of crime, attempting to become legitimate in the eyes of Big Business and Big Religion (the Vatican), but fails…rather epically, in Godfather Part III (1990). Soldier villain May Day (Grace Jones) renounces evil and sacrifices her life to save others in A View to a Kill (1985) and on and on the list goes. Sometimes it actually seems that the more reprehensible a character, the more viewers enjoy experiencing the often arduous process of redemption. Case in point: Richard P. Riddick (Vin Diesel), the muscle-bound, gravel-voiced anti-hero of David Twohy’s futuristic film noir, Pitch Black (2000). This man’s heart is black as night. His eyes are literally steely. His psyche consists as much of animal instinct as evolved thought (the reason, perhaps, he remains restive and calculating even in cryo-sleep). He has all but conquered physical pain, in one instance dislocating both his shoulders to escape imprisonment. 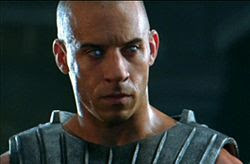 Like many representatives of evil in the media, Riddick seems simultaneously sub-human and super-human. This gripping futuristic film depicts Riddick amongst the survivors of a harrowing spaceship crash as they reckon not only with an inhospitable desert planet far from the commercial space lanes, but also with the environment’s indigenous population: carnivorous, flying dragons that hunt by night (by the millions…) and are very, very hungry. When a long-lasting eclipse grants these flying demons dominion, the human survivors reluctantly turn to the outcast of their bunch to see them through the crisis. That man – that brute -- is Riddick. He is well-acquainted with the dark, you see, and the only man with the vision to face it and fight it. Riddick, sharing a character trait with Old Scratch himself, is also a consummate seducer. Near the film’s climax, when he has reached an escape skiff, Riddick attempts to convince the young captain, Fry (Radha Mitchell) to abandon the other stranded survivors. He compliments her strong survival instinct, noting that he appreciates that quality “in a woman.” Then he plays to her weakness. “No one is going to blame you. Save yourself.” He says soothingly, almost mockingly. Along with Fry, we in the audience weigh Riddick’s words. There’s a ruthless logic to his suggestion. A basis for reasonable agreement. But something inside -- whether conscience, remorse, decency, or perhaps all of the above--won’t allow Fry to abandon the others; to join Riddick in his sociopathic ways. So instead, Fry decides to change him. And that’s where the journey to redemption begins in earnest. “Not for me!” Riddick shouts angrily, flabbergasted and angry that Fry has--in essence--re-activated his conscience. He doesn’t want the redemption, but it finds him nonetheless. He feels unworthy of it; he doesn’t want it. After his escape from the planet, a chastened Riddick finally tells another survivor (a child named Jack) that “Riddick died somewhere on the planet,” an indicator that his heart has indeed been changed; that he has undergone a transformation analogous to one suggested by writer Tennessee Williams. That “Hell is yourself” and “the only redemption” occurs when a “person puts himself aside to feel deeply for another person.” That’s what Fry did for Riddick; that’s what Riddick subsequently does for the remaining survivors of the crash. Finally, I should make note that Pitch Black’s tag line states “Fight Evil with Evil.” Not "Beat Evil with Evil." Because, in the final analysis, it is not Evil that ultimately wins in Twohy’s film; but rather nobility and heroism (Fry’s). Consequently, Riddick’s journey from sociopath and scoundrel to redeemed human being is one that viewers can wholeheartedly approve of. We can all countenance Evil if it pays the price for sinning; if it spies an ugly reflection in the mirror and joins the rest of us in recoiling at the sight. Riddick has finally turned those shining eyes on himself, and emerged, at long last, from the dark. At least until the sequel. A wide-spread blogger malfunction has locked thousands of bloggers out of their blogs, and threatened them with deletion as "spam" within 20 days. Unfortunately, this blog (which has existed since April 2005) - John Kenneth Muir's Reflections on Film and Television - has been targeted and I am effectively locked out from writing, posting and continuing the blog at this time. Blogger has a mechanism for reviewing blogs listed as "spam," and I have activated it. Yet, after reading google help boards, it looks as though nobody at Blogger/Google is minding the store; nobody seems to be noticing. The review process apparently takes...forever. Some writers have already been locked out of their blogs for fifteen days with no recourse or help; not even a "we're working on it." At this time, I am waiting to see what happens next, and attempting to back-up as many blog entries as possible, in the event that this blog is ultimately deleted, so I can continue it at a non-Blogger account. Anyway, if you are wondering why your favorite blogs have not been updated on August 1st, this is why. I will add updates here on a continuing basis ASAP. If it is necessary to create a new blog with a new url, I will post it here as well (assuming the blog isn't deleted...). All my best, and thanks for your patience...hopefully this will be rectified soon.